The mindfulness movement has been criticized as “the perfect ideology for passive acquiescence to the world as it is, a panacea of inner peace” and a way for privileged people to achieve happiness without regard for the suffering of others. Mindfulness is sometimes defined as nonjudgmental acceptance of the present moment. Does that mean mindfulness an opiate that lets us accept injustice? I discussed this question with Christopher Raiche, Values in Action Coordinator at the Humanist Community at Harvard, a long-time meditator who also works on issues related to race and social justice. He believes that mindfulness, understood at a deeper level than mere acceptance, can be an aid in social justice work..
It’s troubling, to say the least, to assert that “happiness is not dependent on external circumstances,” and that you can “[train] the mind to get to a point at which one’s happiness is not dependent on conditions in the world but instead comes from within.” This may be true if you’re relatively comfortable, healthy, and privileged, and are mostly dealing with the frustrations and sorrows of any human life. But what if you’re working two jobs and still can’t make ends meet? What if you can’t find a job at all because you’re transgender and nobody wants to hire you? What if you’re subjected to hateful misogynist harassment and death threats? What if you live in fear of racist police officers? What if you’re dealing with any of the hundreds of forms of systemic oppression? It’s not helpful to be told that your happiness or unhappiness comes from within. First of all, is it really true that we can be joyful without regardless of external circumstances? I believe that as long as our basic physical needs (i.e. food, sleep, healthcare, safety) are met, we can make this shift to happiness. The feeling of joy is generated within our own brains. Let’s say we turned on the TV and learned that our preferred candidate won the election. Was that surge of joy caused by the electromagnetic radiation television emitted? No. The TV provided us information and our brains did the rest. 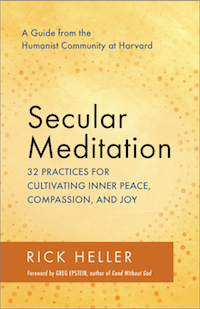 We can self-generate feelings of love and joy through practices such as loving-kindness meditation, a practice that encourages us to leverage our warm feelings toward loved ones and redirect them toward challenging people and challenging circumstances. With practice, one can learn to feel joy even under difficult circumstances. I previously interviewed Matt Tenney, who learned mindfulness while imprisoned and found he could be happy even in that trying circumstance. But is acceptance always a good idea? I don’t think so. Mindfulness derives from Buddhism, which originated 2,500 years ago. In the ancient world, there wasn’t much in the way of social justice movements. The only one I’m aware is that of the populist Gracchi brothers of Ancient Rome. Back then, because your circumstances were unlikely to improve, acceptance was probably the best way to relieve suffering. Things are different now. To me, this captures how we should be thinking about acceptance. There are unpleasant circumstances, such as the inevitability of growing old and dying, that we cannot change. We might as well accept them. Surprisingly, some research shows that older Americans are happier than younger ones; perhaps learning acceptance is a part of it. But when unjust circumstances can be changed, simply accepting them seems unwise. Feelings of discontent can motivate you to fight injustice. Anger (but never hatred) has its place. At a deeper level, one can even be mindful of one’s anger, and thus not be thrown totally off-balance. However, when fighting injustice, people should still seek out moments of joy. It is simply unhealthy to have your fight-or-flight response constantly engaged. Mindfulness can help prevent burnout among health care providers, and it can probably do the same among people struggling for social justice. What about those of us who are privileged, who don’t experience injustice but simply witness it? It would be very easy for us to accept injustices that happen to other people and simply love our privileged lives. The figure of the Bodhisattva in Buddhist tradition represents someone who focuses not simply on finding liberation from their own suffering but helping others relieve their suffering. Perhaps this can become a secular ideal as well. The views expressed on this web site are the personal views of the author and do not represent any organization. I try to adhere to the principle of "compassionate speech," so if you feel something I've written is wrong either in substance or in tone, kindly let me know about it through a comment, or by emailing me at rickhellerpub-media@yahoo.com.